HCE officials with their Chinese partners. The China Machinery Fair is born out of the partnership signed by Bahrain-based Hilal Conferences and Exhibitions (HCE) with Silk Road Steps to Eco-Culture Committee secretary general Zhang Ming, last December. Gulf Industry Fair 2019 will be held under the patronage of HRH Prime Minister Prince Khalifa bin Salman Al Khalifa from September 24 to 26 at the Bahrain International Exhibition and Convention Centre. The Gulf Industry Fair 2019 will focus on the 4.0 Industrial Revolution and its importance to the GCC’s economic diversification. The fair will highlight the current trend towards automation and data exchange in manufacturing technologies. Companies that will be showcased at Gulf Industry Fair specialise in aluminium, energy and environment, industrial metals, industrial processes and manufacturing, ports and maritime, industrial facilities and logistics, training for industry and fire and safety sectors. 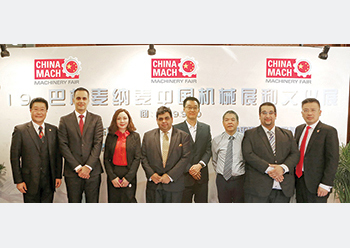 “The Gulf Industry and China Machinery Fairs are taking place at a transformative era for the global economy. Gulf Industry Fair will have a strong international presence from participants from Germany, Italy, US, India, Turkey, Pakistan and Japan,“ added HCE exhibitions director Ahmed Suleiman. Supporting organisations include Middle East Solar Association, Trade and Development Authority of Pakistan, Women in Business International, AHK Saudi Arabia, India’s PHD Chamber of Commerce and Industry, and Bahrain Industrial Association.